Thursday, June 22, 1837.Springfield, IL. Stuart & Lincoln and Logan & Baker file suit on behalf of Joel Wright, administrator of Joseph Anderson's estate, widow Mary Anderson and her son, Richard, against James Adams. In Wright et al. v. Adams the complainants seek to recover possession of ten acres located north of Springfield. They allege that Adams procured title to the land by fraud. Beveridge, Abraham Lincoln, 1:214. 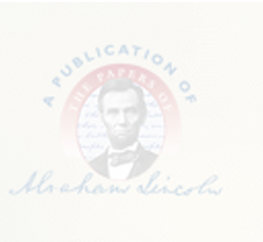 Lincoln files a declaration in H. B. Truett & Co. v. Ransdell, an assumpsit case. In Miller v. Chrisman et al., Lincoln writes a chancery bill for conveyance of land, and he signs the document "Stuart & Lincoln. "Herndon-Weik Collection, Library of Congress, Washington, DC.